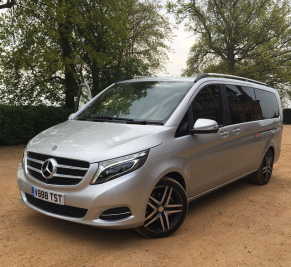 The Mercedes V Class People Carrier is such an adaptable people carrier to have on our London chauffeur cars fleet. Available in two different body styles. 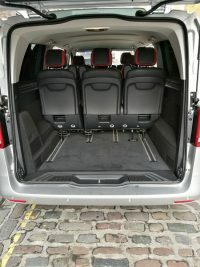 A long wheelbase model that comfortably seats seven passengers and an extra-long wheelbase version known as the Mercedes Vito which seats 8 passengers. The V Class seats are normally arranged facing each other in two banks of three in the rear. However with prior notice and to suit your occasion the seats can be re-arranged to face forwards. Despite the additional size of the long wheel base version of the V Class the boot space is not compromised and can accommodate up to eight suit cases. Both our long and extra-long wheel base V Class people carriers are well equipped with air conditioning and leather seats in the front and rear cabin providing passengers with a very comfortable ride. 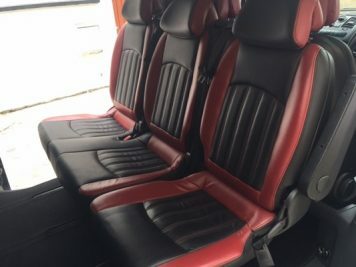 Given the luxury and comfort on offer, you might be pleasantly surprised at just how affordable it is to book one of our Mercedes V Class’s for your planned journey whether this be an airport transfer, corporate business travel, sporting event such as football and horseracing or you have a wedding to arrange and need transport for the wedding guests. Our London chauffeur cars Mercedes V Class People Carrier is the vehicle for all occasions.